in origin. 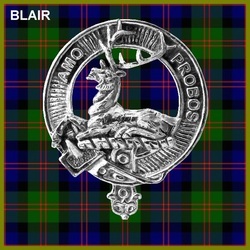 The word “blair”, or “blar”, means “a plain clear of woods”, but through usage came to mean a “Field of Battle”, It is found commonly throughout Celtic Scotland; for example, Blair Atholl and Blairgowrie. The first mention of the name is an entry in “Registrorum Abbacie de Aberbrothoc” 1178-1329 recording Stephen de Blare as a witness to a charter to the monastery of Arbroath between 1204 and 1211. Nisbet records Blair of that Ilk, an ancient family in Ayrshire, receiving land as early as 1205 near Irvine. William de Blar was a witness to a charter of Alexander III to Dumfermline Abbey. Anderson asserts that the family was probably of Norman origin and certainly their martial prowess brought them considerable lands and influence. There are two principal families. The Blairs of Balthyock in Fife and Perthshire, and the Blairs of Blair in Ayrshire. Of Balthyock line, Alexander de Blair and his son Alexander II, are mentioned in a charter of 1214 granting the lands of Konakin in Fife to the Blair family. The Blairs of Blair became prominent about 500 years ago and were chiefs of all the Blairs in the South and West of Scotland. The Blairs of Balthyock always competed with them for the chiefship, until James IV put an end to their disputes and determined “that the oldest man of either family should have precedency over the younger”. The first mention of this family on record is William de Blair, who lived in the reign of William the Lion, in a contract with the town of Irvine in 1205. Sir Bryce Blair of Blair joined Sir William Wallace in defense of Scotland and was executed by the English at Ayr in 1296. King Robert the Bruce knighted his brother’s son, Roger de Blair, for his services after the Battle of Bannockburn 1314. The family continued to grow in prominence and made alliances by marriage with the powerful families of Kennedy, Montgomery and Cochrane. Pitcairn’s Criminal Trials of Scotland notes that on 18 May 1545 John Blair and his son Patrick were required to find security for their good behaviour after consorting with the enemies of the queen (Mary of Guise) at Ancrum. Madeleine Blair of Blair married William Scot, second son of John Scot of Malleny, who assumed the surname of Blair, and continued to reside at Blair in Ayrshire. Colonel Frederick Blair of Blair was decorated for bravery during the First World War, and was an aide-de-camp to George V. The Blairs also flourished in Perthshire where the Blairs of Balthyock may descend from a younger son of the Ayrshire knights. Thomas Blair, the second of Balthyock, received a charter of the lands of Ardblair, Baldowie and Balgillo in Forfarshire in 1399. The direct line of Balthyock ended in an heiress in the eighteenth century but the family of Blair-Oliphant still reside in Ardblair Castle near Blairgowrie. The family has occupied Blair House in Dalry, Ayrshire continuously since 1202 to the present day.